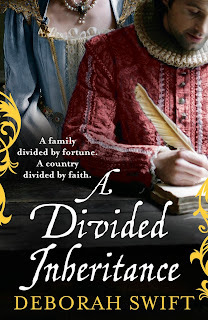 Today I am pleased to welcome back author Deborah Swift as part of her blog tour for her latest book, A Divided Inheritance. "Of many Arts, one surpasses all. 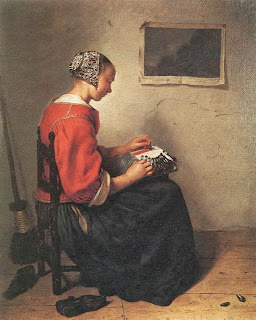 For the maiden seated at her work flashes the smooth balls and thousand threads into the circle ... and from this, her amusement, makes as much profit as a man earns by the sweat of his brow, and no maiden ever complains, at even, of the length of the day. The issue is a fine web, which feeds the pride of the whole globe; which surrounds with its fine border cloaks and tuckers, and shows grandly round the throats and hands of Kings." Jacob Van Eyck, 1651. I became fascinated by lace-making when I found out that in the late Elizabethan and early Stuart periods the craft employed thousands of women, working long hours by candlelight, yet the business side of it – the trade and sales – was almost always run by men. Van Eyck’s view of it is rather rosy, that no woman complains no matter how long a day they work! 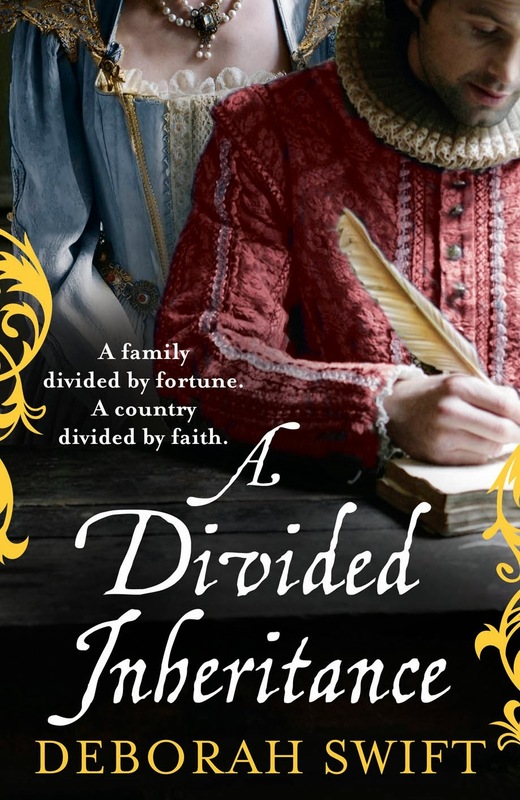 I thought it would be interesting to have a woman learn the business aspect from her father, and this is how the inspiration for A Divided Inheritance began. There are many types of lace - bobbin lace, needle-lace, braid lace, tape lace, net, embroidered lace. Flanders claims to be the birthplace of lace, but can only produce documents referring to lace from 1495, though the Italians claim they have earlier records. Some people suspect that lace originated in China, as early designs have a distinctly oriental feel. 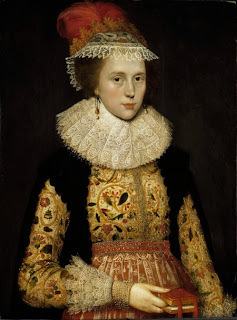 But the flowering of lace in England was in the second half of the sixteenth century, when lace became an openwork fabric, created with a needle and one single thread (needle lace) or with multiple threads (bobbin lace). Starch was developed too during the reign of Elizabeth I and Shakespeare mentions 'free maids that weave their threads with bones...' in Twelfth Night. So the lace ruffs of Elizabethan times were probably stiffened with starch and bones. James I of England had a ruff made of a length of lace 38 yards long which took many women months to complete. 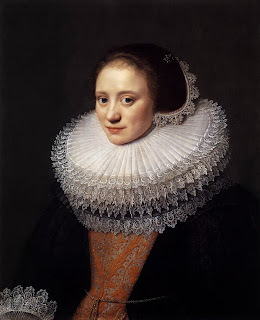 Lace production has always been driven by fashion, and these ruffs, which demanded bold geometric needlelace, were gradually replaced in the early 1600’s. Now the trend was for softer collars which needed relatively narrow bobbin lace. At the same time the fashion for gold and silver lace increased – it was used to edge gloves, shoe roses, jackets and sashes, and also to provide surface decoration for doublets or bodices. Poor children were encouraged to be lacemakers to make them more self-supporting. An experienced lacemaker would teach children from her home or cottage. In 1699 a child might earn 1 shilling and 8 pence a week and a proficient adult 6 shillings and 6 pence. I make lace sometimes, but I make tatted lace. 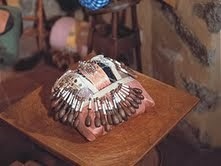 I've seen bobbin lace made and it looks really difficult to make. Some of my friends make, it, though, and have offered to teach me. But I think I'll stick to tatting! Interesting that you have delved into this subject and wrote a book based on it. Hi Michele, tatted lace seems pretty difficult to me too! I can't do any of those crafts - perhaps that's why I find them so fascinating! Thanks for stopping by and reading my post.